Workplace Giving is an easy way to support The ALS Association Florida Chapter. Your gift supports patient service programs and nearly 80 research projects throughout the world. Giving at work through payroll deductions is simple and there are many convenient ways to contribute. 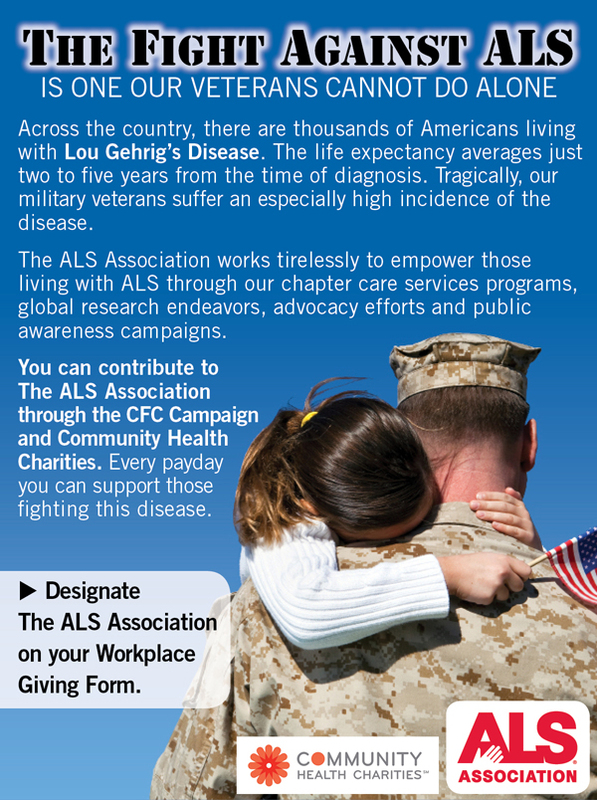 Federal government employees are encouraged to participate in the CFC and may designate The ALS Association Florida Chapter by writing The ALS Association - Florida Chapter on the Workplace Giving Form. The ALS Association Florida Chapter is a proud member of Community Health Charities of Florida. Community Health Charities of Florida (CHC-FL) is a federation of Florida’s premier health organizations that have joined together to raise charitable contributions in the workplace. Employee donations are used to support member charities, which provide research, client services and outreach in local communities. CHC-FL encourages employees to designate to the agency of their choice on the pledge cards and CHC-FL distributes these funds to the agency on their behalf.